One of my favourite and much used perennials has been sadly missing from these pages until now. It's the humble pincushion flower, or blue Scabiosa, easy to grow, easy to keep tidy, and easy to turn rooted cuttings and pieces into new plants. And, of course, this favourite is the most beautiful shade of lavender blue. But there are other varieties - another clump has soft lilac flowers, and I've tried to grow a larger creamy-white scabiosa from seed, without success. I'm tempted by the dark 'black' variety, too. 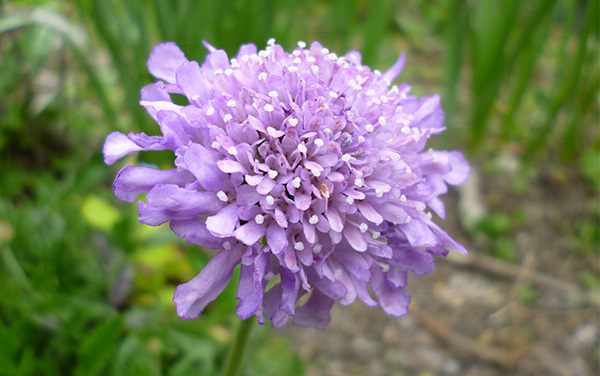 The basic blue scabious will always be my first choice when making a new garden or routing a new path. It's the perfect edging plant, to be found in lots of places in my garden. When I like something I like to repeat it. 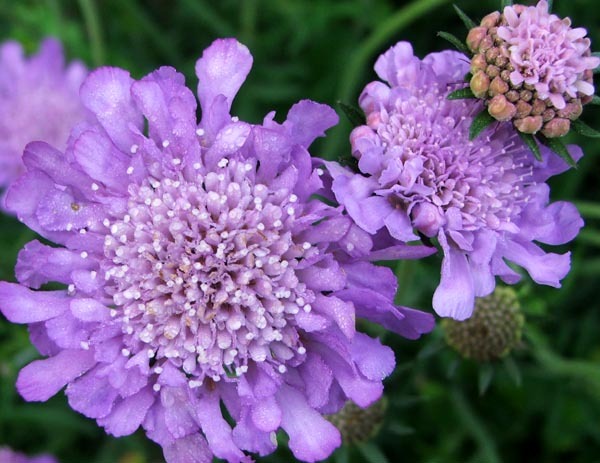 But my bees and butterflies also like Scabious - another great reason for growing it.